In 2006, I went on a 15 state two week vacation. A lot of traveling, but I also saw America in a new light. As an American there is a time, I believe, in our present history that will stay with us for the rest of our lives. 9-11 changed us and after visiting New York, I saw first hand how it has united a city. 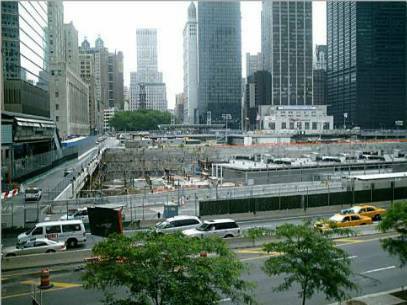 Ground Zero still holds an eerie silence in a city of noise. It is a somber place with make shift memorials on every corner. And it is a place that united a city - where I experienced first hand the helpful nature of its people. New York has a bad reputation, by those who haven't been there. After our week in the area, I better understand the brotherhood/sisterhood of man. New Yorkers don't care if you speak English or Spanish or anything else. They'll find a way to communicate and help each other. We can all say we are in this together, but after walking the streets of New York, it was the first time, I truly felt that way. and it made me proud to say that the area is part of my roots. My memory of that time, after the initial numbing shock and disbelief of the first day, was how strangers became friends and chatted on street corners, in the shops, on the busses and trains. I can only imagine what it must feel like to be there at Ground Zero; a still fresh and gaping wound in the hearts of all Americans who lived through that day. I have not even had the courage to go to "The Wall" yet, and touch the names of those I knew and those I never knew, and feel the overwhelming sadness that was born by every parent, child, sibling, spouse or friend of those who are lost to us forever. It does bring us together, but it also tears us apart. Wonderful poem, welcome back, Dave. Powerful, beautiful tribute; well done! We need to remember what happened on that awful day, and we need to appreciate the freedoms we have here. NEVER FORGET!! Thanks for taking us back there. I know I will never be the same. And while I wasn't there when it happened, the thought of those sounds, the smell of the fumes, the dead and the dying, the feel of the air...all linger in my thoughts. I will always remember it as the day the "Earth Stood Still".